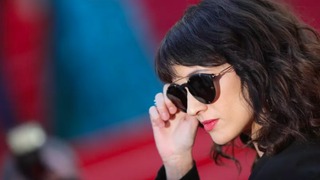 Asia Argento appeared on an Italian talk show to say that she did not, in fact, sexually assault Jimmy Bennett when he was 17, but that it was the other way around. Also, she’d really like her job as a judge on X-Factor back. These are the two main points that Argento wanted to get across. According to the Hollywood Reporter, Argento described Bennett as a “lost son,” and agreed to meet with him to run lines in order to help him out. Filled with pity, Argento claimed, “I told him, ‘OK, Jimmy, maybe we can do a movie together, I can find a part for you.’ He lit up and we hugged at that moment. Then he began to kiss me and touch me in a way that was not that of a child with his mother, but that of a boy with crazy hormones. As for X-Factor, she said she’d like to return “because my children are proud of me, Italy wants me and I have not done anything that I’m accused of,” she said. Food Network’s Alton Brown and interior designer Elizabeth Ingram got married on a boat over the weekend. A Bloody Mary was there, too. Good wedding, IMO.